Surveys and studies are often used to help apply for grants in government or nonprofit work. Surveys are also used in marketing to help determine the demographics of a targeted buying audience. 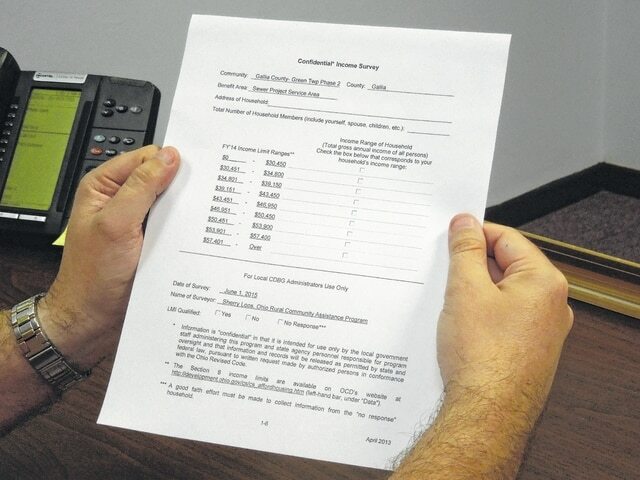 GREEN TOWNSHIP — The Gallia County Commission sent out a survey to be distributed among Green Township residents to better understand the income distribution of the area in preparation for sewer line work. Karen Sprague, Gallia County administrator, noted that because of upgrades to the Gallipolis Wastewater Treatment Plant and agreements made with Gallia County that local communities’ sewage would be traveling into the city to be treated. Green Township, Addison and Kanauga villages are anticipated to join with the wastewater treatment plant. According to Sprague, sewer phase one focuses on the Centenary area, whereas sewer phase two will focus on the Rodney area. Sprague stated there were a few sewer systems in the Rodney area, but with the new lines going in the old lines and septic tanks would be abandoned as the Gallipolis plant took in new waste. The phase one project was estimated to cost around $9 million with the phase two project anticipated to cost around $5.7 million. The projects are expected to be funded in the forms of loans and grants. Sprague noted money could potentially come from a Community Development Block Grant program, which is part of federal funding administered by the U.S. Department of Housing and Urban Development, that “flows” through the state. Survey forms should come in the mail with a letter and form. Residents are asked to complete the survey by June 12. If the form is not completed, someone from the Rural Community Assistance Program will appear to interview home residents. Residents are not obligated by law to participate in the survey. “We’d like everybody to play nice and we hope that people will return the surveys by mail,” Sprague said. She noted that every time one of the RCAP representatives visits a home, it costs the county more money. According to Sprague, there are 376 taps expected to be surveyed in the Green Township area for phase two. “The higher the response rate, usually the more accurate the surveys are and the better we can provide information in applying for grants,” she said. For more information, Sprague can be contacted at (740) 446-4374.